Zombox » Blog Archive » Item weight…. All items now have a weight (although many light items have a weight of zero), and each character can only carry so much. This will make choices about which items you choose to carry with you more important. Also, Susan is now able to use guns, and Roy can now used 2-handed weapons. The consequence is that Susan cannot carry as much as the other characters, and Roy’s 2-handed melee attack is much slower than the other characters’ 2-handed attacks. The reason for this change is that I found the no-gun/no-2-handed-weapon limitation that those characters previously had to be quite annoying during gameplay, rather than challenging. By taking away the item restrictions and replacing them with a more flexible restriction, it’s more fun to play as those characters. 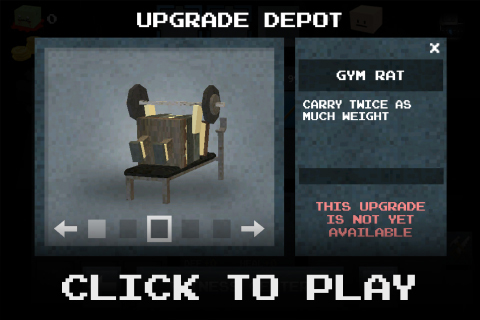 I was wondering if you would ever add something like weight to the game and now look what happened. Taking ideas right out of my head without me ever telling you. It makes following this game awesome. Aha, weight sounds like a good idea. And allowing the other characters to use those weapons, it sounds odd being completely unable to use some. Will there be a balanced character, or are they all going to be specialised? Are you sure there’d be organised newspapers in the apocalypse? And NPCs renting rooms? It sounds like a good idea, I’m just not sure it would suit an apocayptic setting. There’s a balanced character; the one that looks like the original guy at the top of the screen, I think. That’s if I remember correctly. Tyson – keep up the good work. Looks great, man. No rush. If an NPC dies by a zombie do they become infected? Have you optimized the game for the new iPhone and iPod touch ? Maybe you should release the game soon (unless there are a few key components left) and see how people respond to it. And if people run into a problem, you can simply establish an update. But its your game so it’s your call. This game’s getting better every week, man! make it like a beta then every month gather feed back adjust it accordingly and then update…..but like he said your call…..
Yep, once it’s releaed it should work with IP4 and newer. Great idea with the newspapers and magazines! I like that a lot As for the other idea…it’s more complex, but I’ll think about it! Pete is probably the most ‘generic’ character, as his only setback is a price increase at traders. Oh also I should mention that Pete’s special ability is no longer moving faster over a short period of time, but instead becoming invisible to zombies for a short period of time. So his special ability is pretty cool too. Right now NPCs don’t become infected, although that’s something I wanted to implemented. 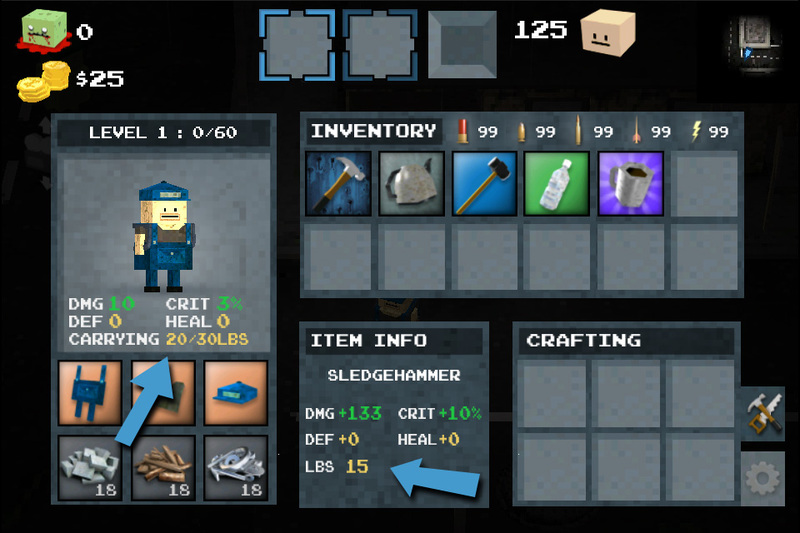 Also I plan to make it so that if your character dies, you can find their zombified body with one of the other characters….if you can kill that special zombie, you can loot the body for your old items! That’s the plan, at least. The game will run fine on the new phones/pads…just need to modify the resolution a bit since the aspect ratio is different. I’ll be doing all that closer to when the game is ready to be released. Have you thought of possible being able to forge your own materials? Bascally you would sometimes randomly find an iron bar or maybe even a crowbar. You would go to a forge and melt it down to make more iron bars after that you would then find an anvil and have to craft your new weapon. You could also have the ability to customize it such as adding spikes for more damage or a hand guard for more defense. Stuff like that. I have a great idea for your game so if I tell you about my idea I hope you like my idea. Basically, I think it would be really cool if you had dragons in it, like skyrim, And you could level up and kill those dragons. After you kill the dragon and get the dragons tooth you can sell it or make it into armour, just like skyrim. Have u got any ideas wat so ever when it will be released, I don’t know about anyone else but I would buy it know if it came out!!!!! Please reply!!!! Release date this year maybe? Kenny I’ve removed your second comment. Please do not post under my username, pretending to be me, again. I keep comments free and open so it’s easy to leave feedback. If people abuse the system I’ll have to enable username registrations and right now I don’t want to have to do that. If any one sees anyone else posting under someone else’s username, please send me an email. When will come out?!?!?!?!? Please reply?? I love this game!!!! -I was thinking that maybe it doesnt have to always be so gloomy and sad looking? What most zombie game developers lack is the realistic qualities. You on the other hand seem to have mastered that, but the lighting just seems so moody as if it were a curse or something. I want it to be like where a virus struck, and the weather and lighting wasnt affected. I want a feel like in dead island where it was a virus, not a voodoo god thing. The game is looking fantastic. I’m wondering why you don’t post the videos on YouTube instead of using animated gifs? I was wondering will you make an update showing the use of every item from the pic in the vehicles items and locations update ? I honestly think, when you do get this game out, major game companies are going to want to buy you out! Not only would i purchase this for my phone, i would purchase this off steam for my PC! @ Moo5e:I agree, getting this on my mac would be sweet! I was curious Tyson, do you find it adds extra pressure to you with so much interest in your game? That’s a good question, Jack. There is added pressure, yes. Although, I sometimes feel like the pressure I put on myself to succeed is greater than the pressure I get from others. I guess I just get very determined to complete something that I’m passionate about, so I set my own standards very high. Really the only bothersome thing to me about the extra attention is the number of repeat questions I get about the project. I understand that not everyone has been following the blog or is up-to-date on what’s going on with the game, but when dozens of people continually email or comment asking me when it’s coming out or if it’ll have multiplayer or if it’ll run on their iPad, it can be a test of patience….because I want to interact with the community and respond to feedback, but not waste time answering the same questions over and over. That being said, I can say the overall experiences I’ve had while responding to people who are interested in the game has been very positive. Your game looks amazing Tyson. I get that you don’t want any added pressure about the game but do you know how much more you have left to add or a release date in mind? A lot of people are excited about this game as am I so maybe you can give us all a month to look forward too? Thats all we want. I really do think you should release the game and see what the internet thinks of it, then you can add updates to fix glitches or mabye add things people talk about wanting, much like Minecraft? Thanks for the answer Tyson! I too feel that pressure put on myself sometimes, and it holds me back from saying “right, that works well- its good enough” and things take longer. I have no idea where the game is up to, but I’m fairly sure he’s made it clear that he doesn’t want to make a release date yet. I’m guessing that a release date simply complicates things and forces feature cuts… And we don’t want that, do we? That is true. I guess i never thought of it like that before. This games up on my watch list with gta v and state of decay:) you got somethin special here because no ones making or has made a game like this. Im excited watching its progress. Keep up the good work. You should create a FAQ for all those questions you have to answer over and over. Maybe a Wiki Page and just crowd source it ? Tyson I Got a idea which is probably in the game but what if when you find a car you gotta lock pick the door and once you get in you have to hot-wire it? And plus did you allready add a radio station to the car so you can listen to music but using the radio station deplete the car battery faster which causes it to break down? I think this is already in the game but what if you can craft like a laser gun or a lightsaber cause that would be epic! YOU KNOW WHAT WOULD BE COOL!!!!! references! try putting references to maybe some of your favorite video games or characters. like have a guy who will give you special “shrooms” for a really cool medicine buff and you go kill a special brown zombie or finds a plumber looking guy in the streets. (if you don’t get it that would be a mario reference but I’m sure you will) it doesn’t have to be mario just choose a video-game or character to reference the event to. and even if theres a strict limitation on memory space you could do maybe just one or two references in there…with no new skins just different dialogue and a slightly different mission. making the game even more real like. I havent seen a post on backpack items. which could carry only so much weight and maybe if your items you are carrying are heavy they could slow you down. Also will both versions of the game be 3 dollars? I want to play this multiplayer and I heard u werent going to make the ios version multiplayer only the pc version so I was planning on getting both but not for 6 bucks! plz plz PLZ add multiplayer like not online mega multiplayer but at least minecraft pe multiplayer. (2 people are using the same wifi and playing it together).Think about a google play release too. I also was wondering if there is a story mode and a random server survival mode. Dunno where you heard that PC would have multiplayer. Zombox will not have multiplayer on any platform. i actually don’t agree with you guys thou i would love nothing more to do than to play this game but we really shouldn’t rush success so we need to wait for the game to become finished. but, that’s just my opinion. Also, on a different point, are you thinking of getting this Greenlit on Steam, Tyson? i think he once said it will probebly not be on steam but i’m not sure if he said that or not. I was also about to do that too! Tyson why don’t you add first person shooter view on zombox like in mine craft? Everyone there’s this game called N.Y. zombies 2 and its comming out on October 25! So knowbody knows NY zombies 2? NY Zombies cannot be compared to this. As far as I know, it’s a completely different style of game. i’m with you, you can’t compare a game the has crafting, npc’s, and all of the other cool things with a game that is just shooting. 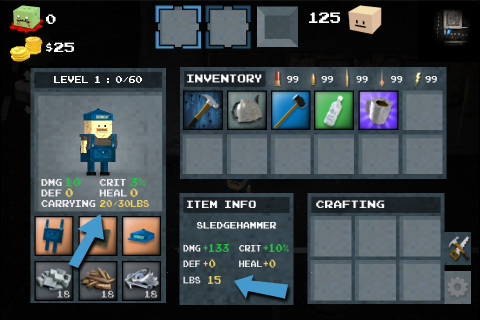 to me, any game that has crafting is awesome and zombox has crafting and alot of more awesome things. technicaaly the only simularity there is to ny zombies 2 and zombox is free roam and weopons! guys i asked tyson about the next update on tweeter and he said the next update is in a couple of weeks because he is busy with work. Subscribe to the official ZOMBOX Facebook, Twitter and Youtube pages for instant updates, videos, and more! When will ZOMBOX be released? There is no official release date yet. Which platforms will it support? Definitely iOS. Hopefully Steam and Android as well. Is there an open beta I can participate in? Not currently. If there is one, information about it will be posted here on the devblog when the time comes. Powered by WordPress v 3.4.2. Page in 0.278 seconds.